Last week, I was sitting outside with a friend for about an hour. It was an unseasonably hot spring day—and I’ll admitI forgot to put on my sunscreen. By the time I got home, my face was as red as a tomato! I began searching through my cupboards for something that could alleviate my sunburn signs, and that’s when I came across my half-empty bottle of aloe vera gel—a staple product that I keep on hand during the hot summer months. While I’d recommend that you always wear sunscreen when spending time outside, if you find yourself in a similarly burning situation this summer, one of the remedies you should turn to is aloe vera. 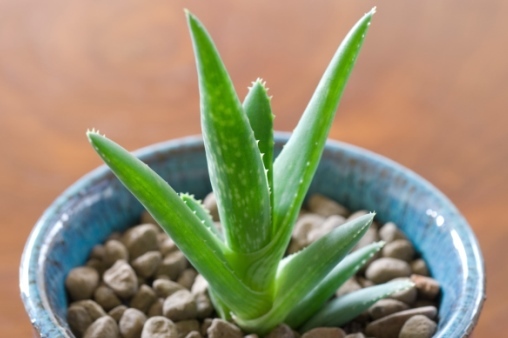 Aloe vera is a plant that’s been used for centuries—first by ancient Egyptians for its medicinal benefits—but you’ve most likely used it to help treat sunburned or wounded skin. However, there is a lot more to aloe vera than its cooling properties. The “magic” from the aloe vera plant can mainly be found inside its leaves, which are filled with a gel-like liquid. In this gel are various vitamins, minerals, amino acids, and antioxidants. The gel is what is found in many of the skin creams you might use to keep your skin moist.The nutritious gel contains an antioxidant group you might already be familiar with: phytochemicals. These nutrients are found in a number of plant-based foods and are known for inhibiting the growth of bacteria that cause infections. They may contribute to the wound-healing ability of aloe vera by supplying a defense against bacterial skin infections.But it’s not just the gel that has medicinal properties. On the outer lining of the plant, you’ll discover a thin, yellowish layer called the latex. The latex is typically used in remedies to treat constipation.Aloe vera juice has also been used to treat plaque buildup, as it mimics the effects of mouthwash. As I mentioned before, aloe vera gel is one of my staple summertime skin care products. After a day in the sun, I typically slather aloe vera gel on my face and body—I have for years. It makes my skin feel cool, moist, and it usually clears up any redness in a rather short period of time.In order for it to be most effective, I suggest applying it multiple times throughout the day to the affected area. Applying a layer of aloe vera gel after showering is also beneficial; it helps lock in moisture that would otherwise dry out the skin if it escaped.Obviously, your primary goal should be to avoid getting sunburned, so make sure you’re smart about your approach to outdoor activities on a sunny day. If you have fair skin, I’d recommend applying sunscreen after about 10-20 minutes of sun exposure, depending on your complexion. Lighter-skinned folks should stick closer to the 10-minute mark, whereas those with darker complexions can apply it after about 20 minutes. This timing should ensure you get adequate vitamin D from the sun’s rays before protecting against UV rays with the SPF! If you have a very dark complexion, you can usually go a little longer before sunscreen is required, hitting the 30- to40-minute range after sun exposure. Aloe vera is also an effective treatment for psoriasis. It can help to relieve the itching and dryness of the condition; however, it doesn’t help in limiting the redness. That being said, it’s worth it to use aloe vera as a topical cream to eliminate the irritation and inflammation associated with the skin condition. If you accidentally burn yourself while enjoying summer activities, like a campfire for instance, apply some aloe vera on the wound. It’s an effective treatment for minor first- and second-degree burns. If the burn is a little more severe, it’s recommended you see a doctor. Remember to always clean the wound before applying the topical aloe vera gel or cream. Aloe vera latex can help with minor bouts of constipation—it basically has the ability to loosen stored stool. Aloe vera latex is taken orally and is often used as an ingredient in constipation medicines. It should be noted, however, that there is some concern about using aloe vera latex regularly as a laxative, because it could potentially lead to cancer or kidney troubles. You don’t want to rely on laxatives for your bowel movements—and they should be used as a last resort if you’re having difficulty passing stool. Use them sparingly at most, and instead, look for ways to include more fiber in your diet by increasing your consumption of high-fiber fruits, vegetables, and whole grains. Research shows that aloe vera juice can have the same effect as the standard mouthwash ingredient, chlorhexidine. Tooth decay and gum disease are common health problems in America, so protecting your mouth from the effects of plaque buildup is essential. Brushing your teeth twice a day and rinsing with aloe vera juice can also help keep plaque buildup at bay. In order to get the best results, use 100% pure aloe vera juice regularly. Research has shown it kills plaque-producing bacteria, like streptococcus. Aloe vera truly is a gift from the earth. Use it wisely and enjoy its cooling (and medicinal) effects this summer! Banu, A., et al., “Efficacy of fresh Aloe vera gel against multi-drug resistant bacteria in infected leg ulcers,” Australasian Medical Journal 2012; 5(6): 305-309. Gupta, R.K., et al., “Preliminary Antiplaque Efficacy of Aloe Vera Mouthwash on 4 Day Plaque Re-Growth Model: Randomized Control Trial,” Ethiopian Journal of Health Science 2014; 24(2): 139-144. Sujatha, G., et al., “Aloe Vera in Dentistry,” Journal of Clinical and Diagnostic Research 2014; 8(10); doi: 10.7860/JCDR/2014/8382.4983.